Apparently, Plumas cannabis patients are already enjoying safe, affordable access to their medicine. 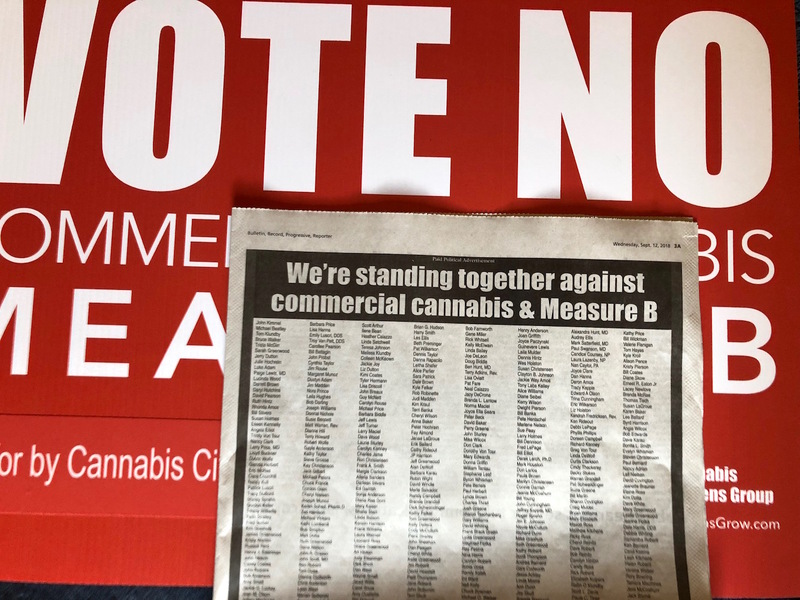 They simply don’t want OR need Measure B’s version of commercial cannabis and are standing with us against it. They’re voting NO on Measure B. ← COMMERCIAL CANNABIS—YES OR NO? One can be supportive of cannabis for medical purposes, as well as take no issue with others’ use of recreational marijuana, yet be soundly opposed to commercial growing of the plant in Plumas County. That describes my stance on the matter. I simply do not want the “unintended consequences “ (the expression my very good friend in Oregon used in describing the effect of allowing commercial growing in my home state) to taint our community. It isn’t that I think those who support Measure B are bad people, or irresponsible, or greedy—I understand that different Plumas County residents have different visions of what the county should be. Measure B does not reflect my vision; it is poorly written and, as such, it poses risks to our community that I am not willing to take.